Very cool - I could easy see how this could be missed on a small biopsy - at least by me ;-) When you look a little closer (be sure to 'show larger' before losing all hope) you can see the streaming bad cells that highlight with the CK5/6. Awesome posts! How does the pathologypics world signout a core (with what recommendations) that has a spindle cell component? Do you even order IHC? 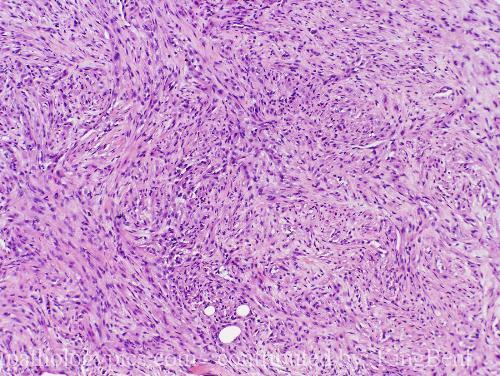 Very good question, considering the broad differential of lesions with a spindle cell component that can occur in breast from the common and benign to rare and malignant: inflammatory myofibrobalstic tumors (one of iago's favs), fibromatosis/desmoid, fibrosarcoma, myofibroblastoma (in men), sarcomas of all flavors (lipo, osteogenic, leiomyo, rhabdo, MFH), the biphasic tumors FA and phyllodes, fat necrosis. I am sure I have missed many in this list. As to what to do with a broad differential or how much workup is done up front before excision - Hopefully someone else will comment. I've heard some speakers at national meetings say that they don't even think twice (I'm paraphrasing here) about spindle cell lesions in the breast. It's signed out as "spindle cell lesion" with "recommend complete excision".